“I think there’s a mistaken pessimism and defeatism among activists thinking that the mass of money stacked against us means there’s no point,” an advocate for third-party contenders tells MintPress. WASHINGTON — The 2016 presidential election is shaping up to be more boring than ever, with the Bush and Clinton dynasties poised to take the reins of America’s corporate capitalist system, likely to deliver unsubstantive debate and the illusion of choice in a duopoly that offers very little in terms of real meaningful change. “We need a good strong challenge, not with the expectation necessarily that somebody’s going to win the election, but that they’re going to help change the course of the debate,” Rocky Anderson told MintPress News. Anderson was mayor of Salt Lake City, Utah, from 2000 to 2008, and the 2012 presidential candidate for the Justice Party, which aimed to remove corporate influence from politics and raise the stakes of the debate around major issues, including the military-industrial complex, torture, and the incarceration system. Anderson told MintPress he will not be running in next year’s elections, but he stressed that third-party candidates are essential because when there is a real political movement behind them, they have the power to transform the nature of the main presidential horse race. As of 2013, 60% of Americans say the Democratic and Republicans parties do such a poor job of representing the American people that a third major party is needed. That is the highest Gallup has measured in the 10-year history of this question. A new low of 26% believe the two major parties adequately represent Americans. He gave as examples Theodore Roosevelt and Ross Perot: Roosevelt ran on the Progressive Party ticket in 1912, coming in second place with 27.4 percent of the vote, beating the Republican candidate, William Taft, while Woodrow Wilson, the Democrat, won the overall election. Perot ran as an independent in 1992 and on the Reform Party ticket in 1996, garnering 18.9 percent and 8.4 percent of the vote, respectively. Anderson argued that even though they didn’t take the elections, both candidates still came out winners because their ideas became so popular that the mainstream parties ended up co-opting them. In the case of Roosevelt, those ideas actually became public policy. “They realized they needed to follow through with things like the 40-hour work week, ending child labor, and old-age pensions,” he said. As for who will pick up that torch and carry it during next year’s elections, Anderson professed his support for Vermont Sen. Bernie Sanders, but was disappointed that Sanders would be running as a Democrat rather than as a third-party candidate. “It really falls upon Jill Stein and the Green Party to do more to raise awareness, and do some long-term movement building,” he concluded. Stein is the most consequential third-party candidate currently campaigning to occupy the Oval Office in 2016. The organizer, physician, and environmental-health advocate was the Green Party’s 2012 presidential candidate as well. Another potential candidate favored by many Libertarian voters is Gary Johnson, who also ran in 2012, and was governor of New Mexico from 1995 to 2003. It is not clear whether he will be running next year. 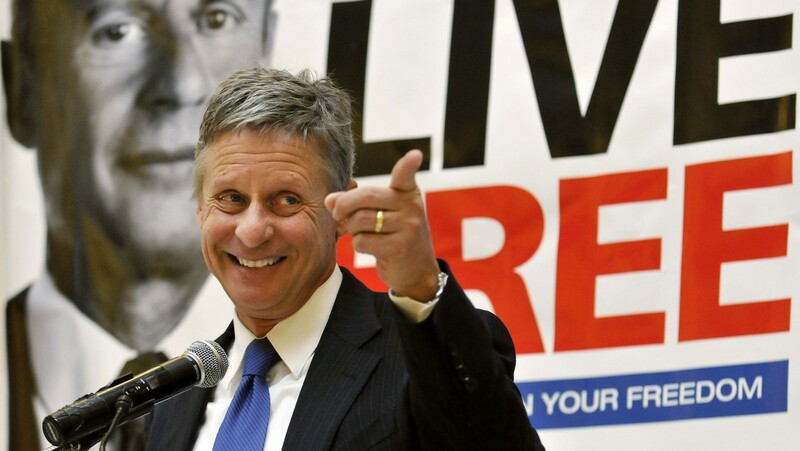 Johnson’s stance, which also includes opposition to the erosion of civil liberties, the surveillance state, and police militarization, was one that the Green Party might also happily support. However, the two diverge when it comes to economic policy. The Green Party has an economic and climate plan, a so-called “Green New Deal,” which proposes to make a 100-percent transition to renewable energy by 2030. In an interview with MintPress News, Jill Stein explained the impetus for the plan, “We have an emergency of the climate and we have an emergency of the economy.” She said both crises are interlinked and have to be solved together, or else neither will be solved. The “Green New Deal” is a reference to economic and social programs launched by Franklin D. Roosevelt from 1933 to 1938 that helped the U.S. recover from the Wall Street Crash of 1929 and the Great Depression. It’s a four-part plan that proposes a nationwide full employment program, a transition to green businesses and low-carbon infrastructure redevelopment, radical financial reform, and enacting, reforming and repealing laws to create a more democratic country. The Green New Deal’s full employment program advances the idea that 25 million jobs can be created through a nationally-funded program that guarantees “a job at a living wage for every American willing and able to work.” The program insists on workers’ rights, a single-payer health care system, a tuition-free public education system, affordable housing, and fair taxation. The proposed transition to a green economy depends on a government that takes the lead in investments toward green solutions to climatic problems, such as pollution and over-dependence on fossil fuels, which has been shown to incentivize war by oil-dependent countries like the U.S. The Green New Deal also proposes radical financial reform measures, which include relieving homeowner and student debt; nationalizing federal reserve banks; breaking up oversized banks; ending many existing taxpayer bailout programs; regulating financial derivatives; restoring the Glass-Steagall Act, taxation for bonuses on bailed out bankers, and the support for the creation of publicly-owned banks. The final dimension of the Green New Deal urges reforms to American democracy. It does so by advocating for the revocation of Citizen’s United and ending corporate personhood. It also supports Rep. Jesse Jackson, Jr.’s proposed “Right to Vote Amendment,” which establishes a constitutional right to vote, and improved voter rights overall. The policy idea proposes the creation of a Corporation for Economic Democracy, which would encourage participatory government agencies that involve communities in their decision-making. And, finally, it proposes to repeal the Patriot Act and other laws that impinge on personal liberty, as well as rein in the military-industrial complex. Speaking to MintPress, Jill Stein also insisted that her platform addresses the human rights concerns of the Black Lives Matter movement, including the spectrum of racism and white supremacy that it is in the process of confronting. As for the incredible amount of police brutality that has come to light in a new way over the last few years with the deaths of Mike Brown, Eric Garner, Freddie Gray, and others, Stein advocated for short-term solutions to immediately relieve some of the problems between police and communities. Helen Shaw talks to people during a rally outside Greater Grace Church, Sunday, Aug. 17, 2014, for Michael Brown Jr., who was killed by police, last Saturday in Ferguson, Mo. She explained that the police need to be fully demilitarized, and that standing investigators are needed in communities so there’s no need to have a special investigator appointed. “This is just the tip of the iceberg,” she admitted. Longer-term solutions would include economic justice solutions, quality schools in all neighborhoods, health care as a human right, and an end to the drug wars, the prison state, and the school-to-prison pipeline. How does a third-party candidate get elected? While many of these reforms may sound great to a variety of voters for various reasons, a third-party candidate has never been elected to the country’s highest office. Millard Fillmore was the last person who wasn’t a Democrat or a Republican to occupy the Oval Office. But his term, which lasted from 1850 to 1853, wasn’t exactly representative of a third-party; Fillmore was a member of the Whig Party, the forerunner to the Republican Party. Meanwhile, the 2012 election resulted in the Green Party, the Justice Party, and the Libertarian Party each receiving less than 1 percent of the popular vote, and zero electoral votes, which begs the question of whether supporting a third-party candidate is even rational. “I think there’s a mistaken pessimism and defeatism among activists thinking that the mass of money stacked against us means there’s no point,” said Philip Locker, Political Director of the Kshama Sawant campaign for City Council & Socialist Alternative Spokesperson, while speaking with MintPress. The Socialist Alternative is a Marxist political party that got Sawant elected to the Seattle City Council in 2013. She was the first independent socialist elected in a major American city in decades, and the first in Seattle for over a century. In this photo taken Nov. 4, 2013, Socialist candidate for Seattle City Council Kshama Sawant, right, speaks outside City Council chambers in Seattle about her support for raising the minimum wage to $15 an hour for all workers in the city. Locker told MintPress the key to winning an election as a third-party candidate is to build the strongest possible movement representing your constituency, which in Sawant’s case was the working people of Seattle. He explained that there are great structural obstacles to getting a left-wing candidate elected to office in a society that favors politicians who are backed by the rich and big corporations, the most significant of these being raising money. Their opponent, Richard Conlin, he said, spent $260,000. “We won’t be able to outspend our opponents, but on the basis of our vigorous campaign, where working people sacrifice and large numbers of people donate, we can make enough money to be able to run a strong campaign to get our message out to the majority of workers who need to hear it,” Locker explained. Other factors contributed to Sawant’s win as well. The Fight for 15, a campaign that champions a $15 an hour national minimum wage, was beginning to take off around the country and in Seattle, where Sawant clearly embraced the cause. Following her election, the Seattle City Council voted to raise the minimum wage to $15 an hour. Locker said the city was also reflecting on the Occupy movement, and the Socialist Alternative resonated for voters who had supported the movement. One critical component of the campaign involved media, he said. Yet he also emphasized that Sawant was completely ignored by media, even independent media, until she had built up a strong enough political head of steam that made her untenable to ignore. But one outlet that did endorse Sawant was an alternative weekly newspaper called The Stranger. Screen shot of 2012 third party presidential debate aired on Ora TV Tuesday, October 23, 2012. From left, Green Party candidate Jill Stein, Justice Party candidate Rocky Anderson, Constitution Party candidate Virgil Goode, and Libertarian Party candidate Gary Johnson. Locker advocated that the media must go much further than the meager support of one alternative weekly, however. He proposed that the labor movement and progressive organizations need to build up their own independent media that is accountable to working people and progressive movements rather than corporations. He explained that the labor movement, which includes large national unions, has hundreds of millions of dollars that it wastes every year supporting Democrat representatives. Instead, he proposes using that money to support campaigns like the Fight for 15, single-payer health care, and other powerful grassroots movements. Further, he explained, it should be building an independent media apparatus that speaks for working people rather than corporations. Sawant is currently seeking reelection for Seattle’s District 3 City Council seat. The Green Party candidate, Jill Stein, echoed Locker’s remarks concerning media attention to the campaign. She explained that she wishes to “force” corporate media to do “real coverage” by bootstrapping her way up into the national consciousness through a campaign that gives political voice to an anti-corporate capitalism movement. However, one of the biggest sentiments reflected among all of the presidential candidates about the state of the union and American politics today was that there are deeper systemic problems that must be addressed. To challenge this, Jill Stein, Gary Johnson, the Libertarian potential candidate, and others have teamed up to make a legal argument against the two-party system. A lawsuit against the Federal Election Commission seeks to open up the presidential general election debates to third parties. The lawsuit asserts that the Commission on Presidential Debates, which limits the number of candidates allowed in the fall debate, is not being regulated properly by the FEC. Stein told MintPress there is another bipartisan case, involving the Greens and Libertarians, as well that has yet to be filed. Sentiment regarding the need for deeper systemic change does not end at the debates. There is a palpable feeling among candidates, but also among society at large, that the corporate capitalist system is broken. But does the key to fixing the system lie in the ballot box? “It’s not that the election is irrelevant, it’s that the election is not the solution,” said Joe Guinan, executive director of The Next System Project, to MintPress. She explained that the NSP lifts up the work taking place in communities like Jackson, Mississippi, and Madison, Wisconsin, which are exploring other kinds of economies. She was referring to an NSP report, “New Political-Economic Possibilities for the Twenty First Century,” which uses Jackson to describe how grassroots efforts by communities in different parts of the United States are empowering people. In Jackson, the Malcolm X Grassroots Movement has started rebuilding the city’s “crumbling economy” through cooperative enterprises and other initiatives, explains the report.